4 Minutes for Walkability — What is it, how is it achieved, and what’s it good for? The key to fighting climate change and mortality? Walkable cities. read the intro, and then watch the short video — I believe that’s a 4 minute time commitment in total — you’ll find it worth your while. An excellent summary of what makes a place walkable, how it’s achieved, and what it’s good for. Enjoy and then get out there and get to it! Counting down to rapid response improvements at Washington & Blue Ledge: Looks like today is the day for start of work! 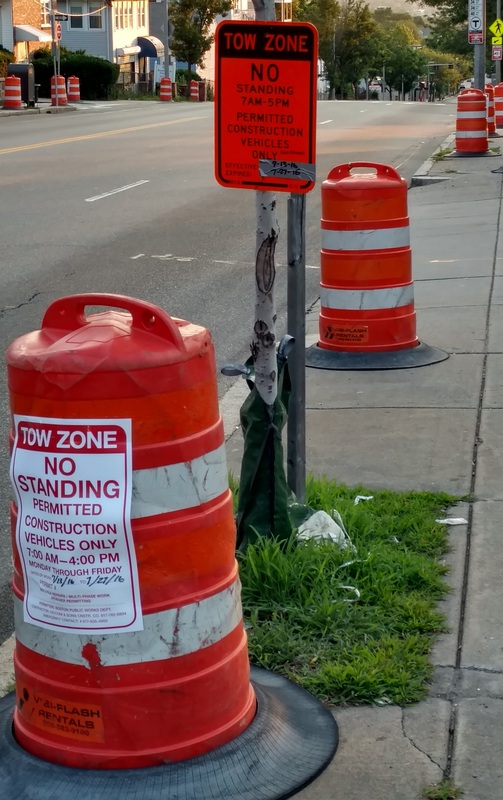 Construction cones went out yesterday, and the signs on the cones indicate that work will take place starting today and last the next two weeks. This is great to see and we will monitor progress here as the improvements take place. Thanks to BTD/DPW for getting this underway. Still nothing further to report. We’re down to 6 days to go to what we understand is the deadline and we’ve risen to 179 days since the crash. As we are documenting here and as the Vision Zero Boston Coalition is documenting on its website, what the city has said about the priority of the rapid response at this location and the others where fatal pedestrian crashes have occurred is not being matched with action on the ground (other than the reported posting of 7 speed boards at 5 locations across the city).